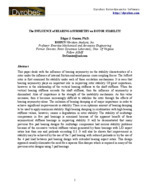 This paper deals with the influence of bearing asymmetry on the stability characteristics of a rotor under the influence of internal friction and aerodynamic cross coupling forces. The Jeffcott rotor is first examined for stability under each of these excitation mechanisms. It is seen that bearing asymmetry plays an important role in improving rotor stability. Of great importance, however is the relationship of the vertical bearing stiffness to the shaft stiffness. When the vertical bearing stiffness exceeds the shaft stiffness, then the influence of asymmetry is diminished. Also of importance is the strength of the instability mechanism. As this value increases, then it becomes increasingly difficult to stabilize the rotor through the effects of bearing asymmetry alone. The inclusion of bearing damping is of major importance in order to achieve significant improvements in stability. There is an optimum amount of bearing damping to be used to apply maximum stability. High bearing damping in combination with high bearing stiffness values, however, causes a degradation in rotor stability. The stability of multistage compressors in five pad bearings is examined because of the apparent benefit of these asymmetrical stiffness bearings in improving stability. It will be demonstrated that many previous five pad bearing designs for multistage compressors had serious stability problems because of the excessive vertical stiffness values generated by these bearings with L/D aspect ratios less than one and preloads exceeding 0.3. It will also be shown that improvement in stability may be achieved by the use of the 5 pad bearing with reduced preloads or by the use of the 4 pad load between pad bearing design with extended bearing aspect ratios. This design approach usually eliminates the need for a squeeze film damper which is required in many of the previous rotor designs using 5 pad bearings.